Over eighty bolted single pitch sport routes along an abandoned railroad bed, a bit south of Safe Harbor Dam. Many of these have updated stainless steel hardware since their reopening in 2011, while some include 1980's or earlier vintage bolts and cold shuts. Approaching from south to north, the climbing sectors reached (in order) are: Blood Sugar Magic, Electric Co., Tenuous Odyssey, Machismo, Super Slab, Autumn Arch, the Righteous and the Wicked, Numero Uno, Train in Vain, and Hydroman. Eric Hörst's Safe Harbor Climbing website has a few mini-guide to climbing the south areas. The area divisions used here are his. From Lancaster, Pennsylvania, take New Danville Pike south to Conestoga (5 miles from Central Park, Lancaster). Turn right on Main Street (3 1/2 miles). When Main Street ends in a T-intersection, turn left of River Road, and you will drive through Safe Harbor Park. If your party has more than one vehicle, leave them at the park, and carpool from there. After turning left (south) on River Road at Safe Harbor Park, continue on River Road as it winds back uphill. Turn right on Green Hill Road. At the first four-way intersection, turn left on Brenner Hollow, and then take another immediate right back onto Green Hill. In another mile or so, just before a flower preserve sign, Green Hill turns downhill onto a gravel road and to a tunnel. Park just before or after the tunnel (remember that everyone has to U-turn and drive out past you). There's enough room for many vehicles to park here. Check for recent "No parking" signs, in case of recent changes. A few feet from the northeastern side of the tunnel on Green Hill is the start of an unmarked climber's trail that leads from Green Hill Road to the Enola Low Grade Trail (the rails-to-trails trail). Walk through the woods for 5-10 minutes, mostly uphill, until you emerge from the woods onto the Enola trail, which is 50+ feet wide, completely covered in gravel, and flanked by a line of power lines. Turn right (north) and walk until you see bolts on the wall to your right (about 1/8 to 1/4 of a mile). Warning: If you end up on the lower rail trail, with rails and trains running on it, you're off-route. Dusk on the walk back to the car. Inside the tunnel, inside the soul. The following bit of the "Getting There" section is pretty confusing: "On the uphill side of the tunnel off Green Hill Road, follow a side trail uphill next to high tension power lines. 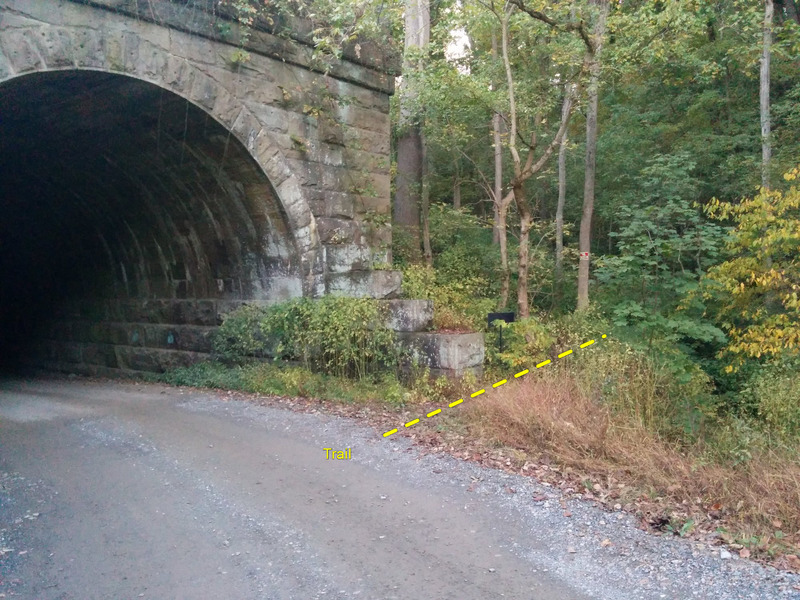 It will connect you to the old rail trail (with no rails left) where it crosses over the top of the tunnel." Here's some clearer directions: A few feet from the northeastern side of the tunnel on Green Hill is the start of an unmarked climber's trail that leads from Green Hill Road to the Enola Low Grade Trail (the rails-to-trails trail). Walk through the woods for 5-10 minutes, mostly uphill, until you emerge from the woods onto the Enola trail, which is 50+ feet wide, completely covered in gravel, and flanked by a line of power lines. Turn right (north) and walk until you see bolts on the wall to your right (about 1/8 to 1/4 of a mile). 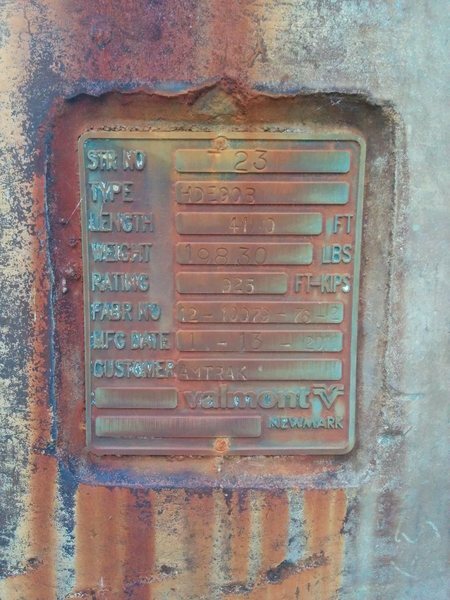 The powerline poles that run along the trail have plates with numbers. The tower closest to the trail to Green Hill Road is T 14. The tower closest to the Port-o-John is T 23.